Should You Add LIBERTY GLOBAL PLC (LBTYK) to Your Portfolio? In this article, we are going to discuss LIBERTY GLOBAL PLC (NASDAQ:LBTYK), in which 56 funds tracked by Insider Monkey held shares at the end of September. 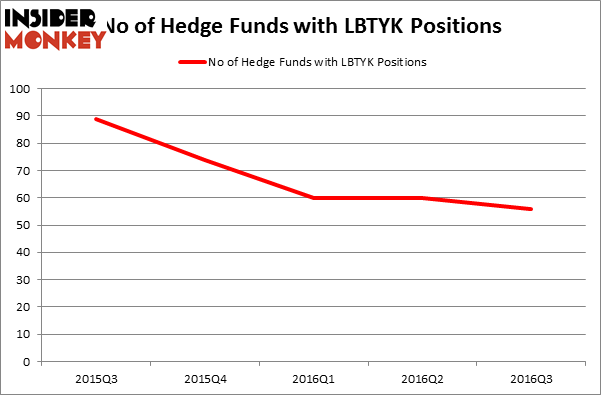 LBTYK investors should be aware of a decrease in hedge fund interest, as there had been 60 funds with LBTYK positions at the end of the previous quarter. At the end of this article, we will also compare LBTYK to other stocks including Manulife Financial Corporation (USA) (NYSE:MFC), Equinix Inc (NASDAQ:EQIX), and eBay Inc (NASDAQ:EBAY) to get a better sense of its popularity. Now, let’s view the new action regarding LIBERTY GLOBAL PLC (NASDAQ:LBTYK). How have hedgies been trading LIBERTY GLOBAL PLC (NASDAQ:LBTYK)? During the third quarter, the number of investors from our database long LBTYK declined by 7% to 56. With hedgies’ positions undergoing their usual ebb and flow, there exists a select group of noteworthy hedge fund managers who were upping their stakes considerably (or already accumulated large positions). According to Insider Monkey’s hedge fund database, Boykin Curry’s Eagle Capital Management has the largest position in LIBERTY GLOBAL PLC (NASDAQ:LBTYK), worth close to $1.1923 billion, corresponding to 5.1% of its total 13F portfolio. The second largest stake is held by John H. Scully’s SPO Advisory Corp, which disclosed a $944.6 million position; the fund has 16.6% of its 13F portfolio invested in the stock. Some other members of the smart money with similar optimism comprise John Ku’s Manor Road Capital Partners, Lou Simpson’s SQ Advisors, and Philippe Laffont’s Coatue Management.